There is presumably a trend toward depoliticization of character education as character educators claim to teach universal values and engage in community-based decision making. However, as Tianlong Yu argues in this book, under the umbrella of universality, character educators define virtues based on neo-conservative ideologies. In the name of community, they trivialize issues of gender, race, class, and culture and promote the interests of dominant social groups. 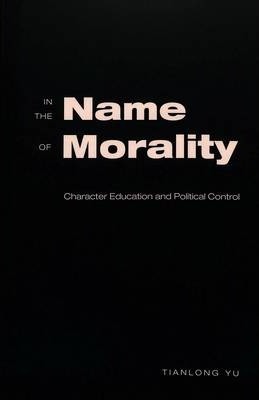 In the Name of Morality: Character Education and Political Control traces the historical origins of character education and stimulates readers to look critically into the social interests, power relations, and political agendas that have shaped the character education movement in the United States. This challenging, yet engaging, book reaffirms the crucial relationship between moral education and politics. It is a must-read for anyone who is concerned about students' character building and moral education in schools. The Author: Tianlong Yu is Assistant Professor of Education at D'Youville College in Buffalo, New York. He received his Ed.D. in educational theory and practice from the State University of New York at Binghamton. Before coming to the United States, Tianlong Yu was an educational researcher in Beijing, China.